The first round of Envision Loudon workshops to bring in public input on the ongoing comprehensive plan rewrite will wrap up with two extra meetings. Supervisors Tony R. Buffington Jr. (R-Blue Ridge) and Geary M. Higgins (R-Catoctin) cooperated to schedule an extra meeting Dec. 5 at Woodgrove High School in Purcellville, the first Envision Loudoun workshop in western Loudoun. There will also be another meeting Dec. 8 at Cascades Senior Center. Both meetings begin at 7 p.m. Previous meetings were held in Leesburg, Lansdowne, Sterling, and Chantilly. In previous sessions, county staffers and members of the Board of Supervisors-appointed stakeholders committee heard people in packed meetings toss around ideas for the future of Loudoun—ranging from transportation, to the Transition Policy Area, to development and housing, to education and parks. Discussion leaders guide groups through open-ended discussions and try to make sure everyone has a chance to share their ideas. 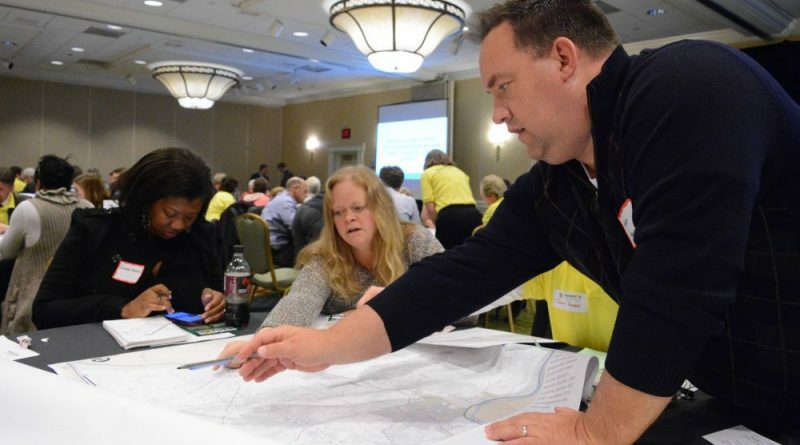 County planners and consulting firms will take the ideas they hear at these Envision Loudoun meetings back to their work on rewriting the comprehensive plan, which will guide Loudoun planning and policy for decades. Envision Loudoun addresses growth, land use, transportation, community facilities and amenities, economic development, and fiscal management. More information, including a link to RSVP for a workshop, is online at envisionloudoun.org. What concerns me is that Western Loudoun was left out in the first place. It seems to me that this was done on purpose so as to cut out anti-development comments. Having attended the Leesburg session, the anti-development comments were ubiquitous anyway. It will be interesting to see what comes of these sessions. My fear is that this will be used like the transportation issue was a few years ago. People were polled and their top issue was transportation. So, under the banner of “transportation” we got a big tax hike. Then politicians looked for ways to funnel off the money from their new cash cow. Are the local politicians doing the same here? Are they looking for words to appeal to the masses and then will shove more housing down our throats anyway?